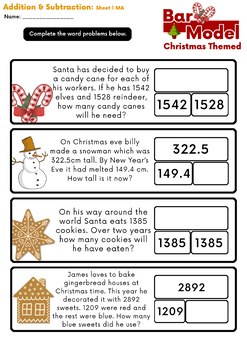 A FREE sample of our Christmas themed addition and subtraction word problems using the bar model. Check out the full pack here. 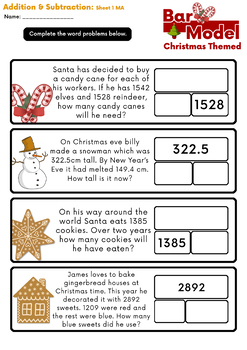 A set of Christmas themed NO PREP differentiated word problems using the bar model strategy, focussing on addition and subtraction for grades 3 - 4. The bar model is great to help children visualise and solve problems and is becoming much more widely used across schools. 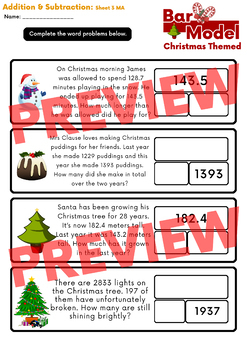 This pack will guide your children through the idea, giving them loads of practise at applying it to word problems. 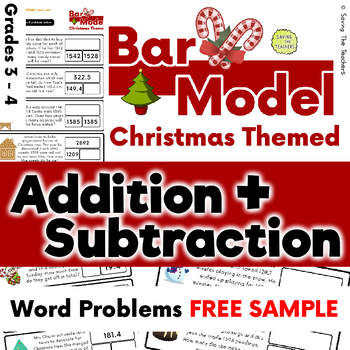 The full pack contains 3 sets of word problem sheets each with 3 levels of differentiation. Please don’t forget to rate this product and provide feedback to earn credits that you can use toward future purchases on TpT. Also be sure to visit my store and FOLLOW ME to see my new products and hear about upcoming sales!